There’s something so soothing and inviting about the mature trees that shade Pinchot Avenue and the green, irrigated lawns that separate the houses from the street. And then you step inside one of the handful of homes that make up Phoenix Homesteads Historic District and the thick adobe walls provide another layer of cool, quiet comfort. These homes are special. Very special. Built from indigenous materials (i.e adobe, a mix of mud and straw) as a WPA project during the Depression, Phoenix Homesteads is the only neighborhood of adobes in Phoenix. You will find an occasional adobe home elsewhere, but to find another neighborhood remotely like this you have to go to Glendale. Did we say they were special? We meant it! These Pueblo Revival homes average 1400 square feet, on lots that range from one-third to three-quarters of an acre. The only trouble is that there are only a handful of adobes along Pinchot Avenue, not nearly enough to make everyone happy. So it’s a good thing that there’s another “homestead” in this district, on Flower Street just two blocks north. The homes around Flower, also built of adobe built and designed to be efficient and affordable to own, are built on standardized 1/4 acre lots. That’s still a generous amount of land in an historic district, and makes for a decidedly rural feel. The architecture is a bit more standardized too, which doesn’t make them any less special. 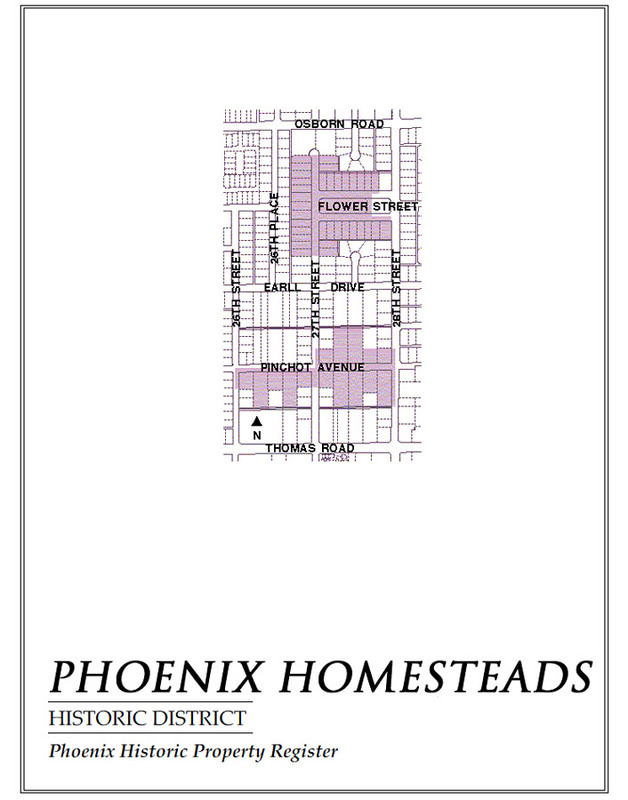 Phoenix Homesteads Historic District is farther east than all the other districts, so it doesn’t have the walkability of the central corridor. What it does have is closer proximity to some other great Phoenix spots like Gaslight Square Plaza at 36th Street and Indian School. (Maureen loves Mama Java’s coffee and the Book Gallery where she can get lost for hours browsing the rare and used book selection.) If Don’s getting in his car, he would venture a little farther for the yummy bruschetta at Postinos or a Tammy Coe cake from La Grande Orange Grocery (Campbell & 40th Street). If a large irrigated yard and a smaller energy-efficient house that is a cocoon of cool, quiet adobe sounds like home to you, you will want to check out Phoenix Homesteads.